Here are a few tips we believe work and we want to share them with you. 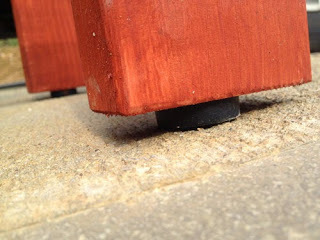 Hive stands are not just a way to keep your beehive off the wet ground but much more. We have given a lot of thought to this over the years and yet few books or beekeeping article address this. So here it is- our list of The Good, The Bad & The Ugly. A single stand gives your beehive great centralised support as the honey starts coming in. The average overall weight of a beehive in the height of the season will be 70-100 kilos. If you have constructed a shared hive stand than you need to take this into account, otherwise you will find the enormous combined weight buckles your stand and breaks over time. Beekeepers use a number of stand designs, mostly only taking into account cost and convenience. A single wooden beehive stand, just smaller than the size of the floor, will allow rain water to run off the hive walls and fall clear of the stand, keeping it far dryer and extending it usable life. The base of each leg of your beehive stand should be raised off the ground slightly so it is not in contact with the damp ground. This will extend the life of the wood, reducing damp rot. We found years ago that audio speaker rubber vibration foot pads work really well. 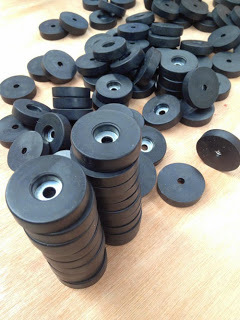 They come with an incorporated metal washer in the centre of each rubber surround. 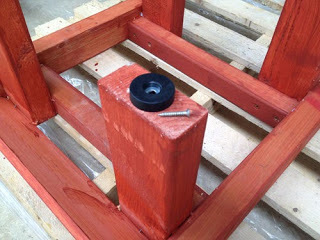 You can screw this to the bottom of each leg, which raises it off the ground by 5cm. The rubber does not rot and it helps to stabilise the stand while absorbing a bit of the vibration externally and some of the vibration you cause while carrying out your routine inspections. See the photos below. Shared stands. The most common being two metal rails supported on blocks. Hives are placed side by side on the rails. The problem with this design is vibration. As you open and inspect your first hive of say three or four on the same stand, all is well. By the time you have closed up your first hive, the second hive is well aware of your presence and are on guard. You have calmer bee activity for approximately the first 5-10 minutes when first opening up a beehive. Your bees are more concerned about the smoke you puffed in then you poking around. After approximately 10 minutes and many puffs of smoke later, your bees will begin to realise the hive is not on fire, and that person in the big white suit is annoying us. So given you just worked the first beehive for around 10-15 minutes or more, the next hive is slightly more aware of you and on alert as the vibration travels down the shared stand rails. By the time you get to the forth hive on the same shared hive stand you might think these bees are just very bad tempered and need sorting out. This is not the case. They have just been feeling all the bumps and knocks from you inspecting the other three hive over the last 45 minutes. Palletised beehives, four to a pallet is for speed only. This method is used in pollination contacts where farmers need a ‘bee drop’ of many hives for a short period. The idea for the beekeeper is easy off loading and quick loading. Most farms just want the bees there for a few weeks so this method works. Little beekeeping management goes on until they are back at the home apiary. Milk crates, trash bins, rubble pile. Boy we have seen some pretty bad make shift stands in our time. We feel the bees and the over all look of the apiary deserves more. Milk crates will, and do, buckle under the growing weight of the honey coming in. If it is a warm day buckling can happen quite quickly as with any plastic construction super heated. The main reason for the beehive stand is to raise it off the ground to improve air flow around the hive. It is important to reduce condensation within your beehive as much as possible. A beehive raised off the ground achieves this and helps to maintain a healthy living environment for your bees. Keeping grass short and plants well away from the beehive entrance will improve air flow. The height is a personal choice, but around 30cm off the ground is good. When making or buying your beehive stands consider what is a good working height for you. Work out when bending over where will the top of the brood box be. This is where you will be spending most of your time, inspecting each frame and placing them back in. If the stand is too heigh or too low this will create back problems for you over time. Remember you will only be lifting the supers off the hive and placing them to one side, not inspecting them in great detail. So the important height level to consider is where your brood box finished height is.